Clients often ask us to explain the differences between medium and long term price performance and which would best suit their portfolio. There are a lot of variables at play but also some basic forces that you should be aware of before making any plans for the future of your portfolio. The wine market revolves around the basic principles of supply & demand but quality, longevity and price also have a hand in determining your potential for growth. In layman’s terms you need to acquire the highest quality ‘investment grade’ wine you can afford, at the right price and allow plenty of time for the supply and demand of that wine to swing in your favour. As these wines age not only do they improve in quality but naturally, as people begin to consume the more mature stock, the quantity of that wine available on the market decreases which should drive values upward. For over a decade Cult & Boutique Wine Management have supplied wines with five years storage and insurance included in the purchase price, as historically this has proved long enough to generate an adequate level of capital growth. However, the market has changed dramatically during the last decade and one of the most important lessons time has taught us is that you should also consider the benefits of a longer hold term of ten or fifteen years. Take the example below, the 1982 Chateau Lafite Rothschild was first offered to the market in 1983 at a whopping £275 a case. 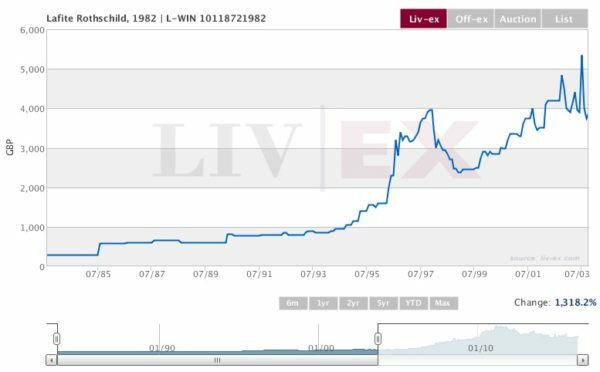 Over the following five years the value of this wine gained an impressive 118% at which point we’re sure many investors disposed of their holding and were happy with their gains, and who wouldn’t be. In the following chart we have extended the hold term by an additional five years to show a ten year hold. You can see that trading starts to become more frequent, as the wine is beginning to approach or enter critic’s suggested drinking windows and people start to acquire for consumption. After 10 years the Lafite ’82 managed 209% growth, again very respectable. 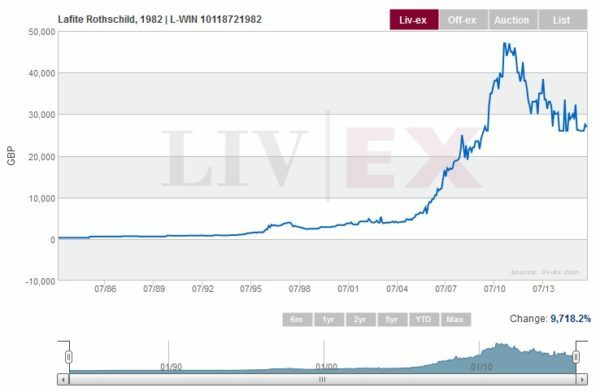 The fine wine market really comes into it’s own when the supply starts to tighten and a wine becomes a collectable ‘trophy’. If we fast forward an additional ten years and display a twenty year hold term the results are very impressive, achieving over 1,300% growth. Again you can see the frequency of trading increase as buyers rush to take a position with what is fast becoming a very lucrative asset. 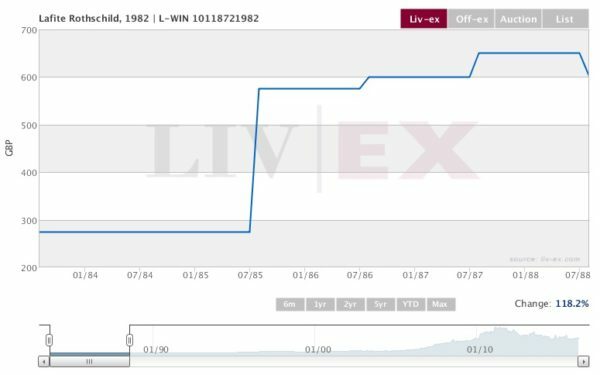 By the time Lafite ’82 reached it’s peak price in 2010 it had managed to reward those early buyers with a growth of 16,990%. Fair enough, it took twenty seven years to get there but with an average of 630% per annum for those that held on, we feel it would have been worth the wait. Most Clients will be aware that the market showed unprecedented losses after 2010 and it would be misleading for us to ignore the price correction in this study. 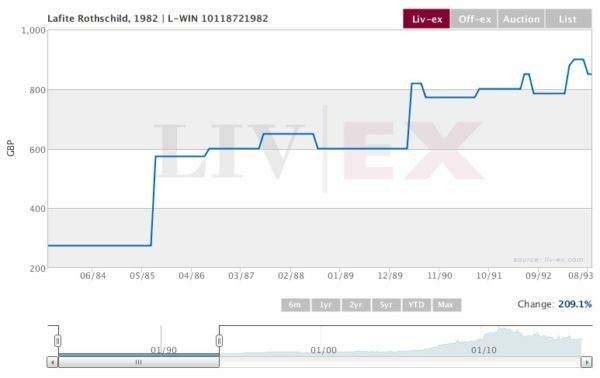 In the chart below the current Liv-Ex market value for a case of 1982 Chateau Lafite Rothschild is £27,000, 40% down from it’s 2010 peak market value of £47,000 but still a massive 9,718% above its original release price of £275. This would represent an average annual growth of 294% over the 33 years that the wine has been on the market. 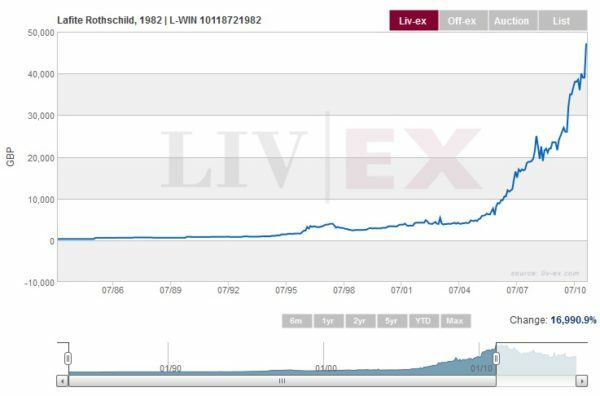 This is probably one of the best examples of a wine rewarding over the long term hold but it is not an isolated occurrence, there are countless examples of fine wines showing long term growth that is unparalleled in traditional financial markets or products. If you haven’t considered wine for long term growth yet it would be worth contacting your Portfolio Manager to discuss your objectives, budget and time scales to see if we help you tap into this growth for yourself. Many Clients adopt long term strategies when arranging legacy options for children, grandchildren or other loved ones. We have access to a selection of wines that we would recommend for extended hold periods and can work with you to create a package that suits your needs.